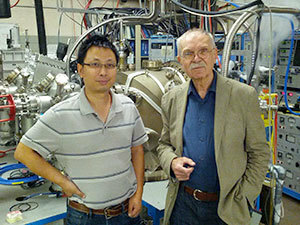 University of Notre Dame physicists Jacek Furdyna, the Aurora and Thomas Marquez Chair in Information Theory and Computer Technology; and Xinyu Liu, research assistant professor, have collaborated with Purdue physicist Leonid Rokhinson on constructing a novel nanostructure that has allowed them to observe a long-sought-after particle referred to as Majorana fermion. The existence of this particle was predicted by Ettore Majorana in the 1930s, but until now has eluded observation. Their findings were recently published in Nature Physics. The long-standing interest in finding the Majorana particle has been twofold. First, from the point of view of fundamentals of physics, the particle has new and completely unique properties that range from its zero mass to the type of statistics to which it conforms. And second, precisely because of its novel statistical properties, it holds great promise for fault-tolerant quantum computation — a field that is expected to revolutionize the way computing will be done in the future. The challenge in detecting the Majorana particle was to find a suitable solid-state structure in which it could reside. 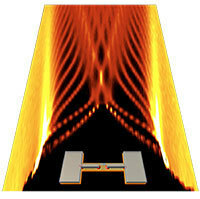 The team jointly designed a one-dimensional hybrid system (nanowire) composed of a semiconductor (indium antimonide) and a superconductor (niobium). The unique properties of this hybrid architecture then enabled the observation of the so-called fractional Josephson effect, a direct signature of the Majorana particles. Differential conductance as a function of dc and rf currents is shown for a Josephson junction fabricated from a topological semiconductor/superconductor hybrid structure. The inset is a schematic of the device, showing location of Majorana fermions as red dots. The important critical step that the discovery of Majorana fermions offers toward quantum computation arises from the fact that they can be used to encode information in an extremely robust manner, in a way that is protected from decoherence due to local noise. Specifically, the Rokhinson-Liu-Furdyna experiment was aimed at demonstrating the existence of a pair of Majorana particles at the ends of the hybrid semiconductor/superconductor nanowire. The appearance of these particles is due to the specific interactions between groups of electrons and atoms in the crystal lattice of this nanowire. If quantum information is stored in the Majorana state, the information storage is not in the individual carriers, but in their relative configuration as a whole; in other words, the information is stored nonlocally, and is therefore significantly more robust. Liu added that having a crystalline structure such as that constructed by the Notre Dame/Purdue team, which can be used to “house” Majorana particles and to control them by electric and magnetic fields, already represents an important practical step toward the realization of the distant, but now more realistic, goal of achieving hardware for quantum computation. A paper detailing the work is available in the online edition of Nature Physics and will be published in the next issue of the journal. The work was partially supported by grants from the Army Research Office and the National Science Foundation. Originally published by Marissa Gebhard at newsinfo.nd.edu on October 03, 2012.